When you open the book for the first time there is a dedication that I think sets the tone for the whole book. It reads quite simply ‘For Sheila and for You’ Sheila who was James Hannah’s wife’s (Christine) mother who’s care by the St Catherine’s Hospice in Preston provided the basis for the story but sadly Sheila never got to read the book that inspired the story and then ‘You’ being not only a reference to Ivo’s girlfriend but you the reader. The A-Z of you and Me is a story as told by Ivo he is very sick and in a hospice, Ivo is recalling his life that is shot through of regret and lost chances it is in fact a love story. His nurse Sheila has started to encourage Ivo to play the A-Z game to keep him sane, but no ordinary A-Z game this, it is one where Ivo has to come up with a story connected to a body part. Ivo is 40 and dying and he knows all too well what is to come. Many recollections of his girlfriend with whom he describes as just ‘you’ his Sister Laura and his best friend in life ‘Mal’ This is a story full of heartbreak and love and regret as Ivo play’s out the A-Z game and the stories that are surrounding each part of his body. Ivo starts with A and Adam’s apple and recalls the story he was told by a vicar when he was a child, every part of the anatomy is just about covered in this game as told by Ivo. Anyone reading The A-Z of You and Me will draw comparisons with David Nicholls One Day, it is a beautifully written story that is both full of sadness, yet warmth but also at times really quite humorous. Writing a debut fiction novel about life, love and death is not easy and the way in which Hannah has gone about this story and weaving the these facets into a deeply moving story line is something I shall take from this book and the potential that The A-Z of You and Me will have among readers is something that only this type of novel can bring. Readers will be wanting to know more about ‘you’ and his best friend Mal with every turn of the page not to mention Ivo working through every body part. The A-Z of You and Me is quite simply beautiful, heart-breaking, and as for the ending just be ready. Like life itself this book has a beginning and an ending but just for once I really wanted this story to continue for reasons that will become obvious to anyone who buys the book. My recommendation is simple. Please go and buy a copy today. I promise you will not regret it. James Hannah divides his time between London and Shropshire, UK. 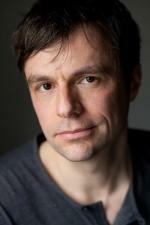 He has a Master’s degree in Beckett Studies from the Beckett International Foundation at Reading University. His first novel, ‘The A to Z of You and Me’ was published by Doubleday in March 2015, and was long listed for the Desmond Elliott Prize. To coincide with the release of The A-Z of You and Me in the shops today there is a chance to win a signed copy. To enter please go to my Twitter page @Thelastword1962 and look out for the prize draw message and re-tweet the message. *The competition closes at 8pm Thursday 27 August and is open to UK and Eire residents only. 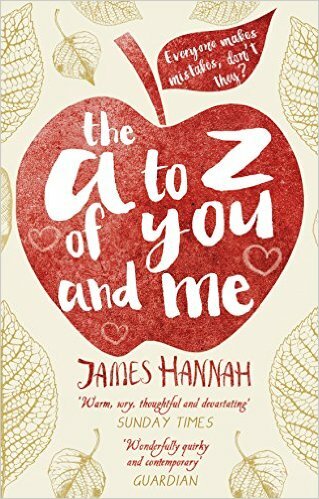 Posted on August 27, 2015, in Doubleday, James Hannah, The A - Z of You and Me. Bookmark the permalink. Leave a comment.